In February’s Kids' Studio Time, we’re going to focus on incredibly detailed, hand-painted eggs known as Kraslice (pronounced kras-li-sa), the Czech word for Easter Egg. 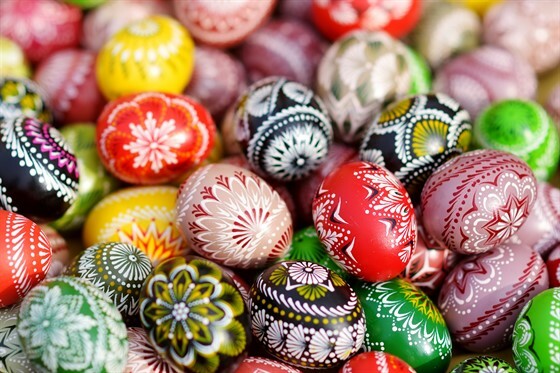 Throughout the Czech Republic, the Easter egg designs are elevated to a high art form. Kraslice is a excellent example of repetition, one of the elements of art. This class is for children 8 - 12 years old. An adult must accompany the child for the duration of the class. If you are signing up for a class for the first time online, you will need to create an online account during the checkout process. (If you've purchased tickets to events at The Center, you may use the same user name and password.) When choosing quantity, only choose the number of children signing up for the class. There will be a prompt to enter their names for the roster.